This year, why not try a new ride, through the heart of 'one day classics' territory. Explore Northern France, Belgium and Luxembourg, and the pavee secteurs of the incomparable, Paris Roubaix. 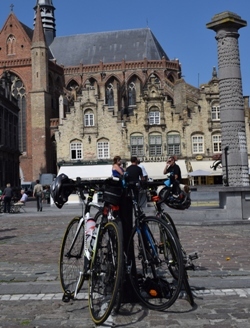 3 days, of riding, 1 to reach the English Channel, crossing Kent, and then 2 big days of 200km (albeit on flattish terrain) to pass through some of the beautiful countryside that creates the border between France and Belgium. Departing from London - get ready for an all new challenge ride spectacular - taking in Kent, France, Belgium and Luxembourg. With options to join a group to take in the cobbles of the specialist Paris Roubaix 'secteurs' you may want to add some special padding to strategic points of your bike (NOTE - the cobbles are not compulsory!). Day 1 starts early from Central London, and heads out to Rochester, then Canterbury before reaching the ferry at Dover. We still have a short ride on the French side - so have your lights ready - just in case! Day 2 is the really big one - 210km, including some special cobbles - and the famous Ahrenburg Trench, made famous by the likes of Fabian Cancellara and Johan Museeuw. Overnight location tbc - subject to hotel availability. Day 4 - Participants return by air travel (not included) - Adventure Cafe return bicycles to designated location by early evening. Will be in modern, simple hotel accommodation on all 3 nights. You will be sharing in twins or triples. If you require a single room then please request this at time of booking (a supplement of £145 will be payable). The cobbled secteurs are 100% optional - and for riders who are struggling, we shall enforce strict cut off times in order to ensure we arrive at our evening hotel by nightfall. These will be set out in good time - so you know what you are aiming at. Provided you are at the correct fitness level, and you don't spend too long at feed staions, you will have plenty of time! Note also - that on larger corporate events, we plan to offer pre-prepared feed stations - to minimise the amount of stopping required. OPTION FOR 2 Day Ride - note, that if you do not have enough annual leave, you may join this ride in Dover on Friday afternoon, and ride with us to our overnight in St. Omer. 3 nights Bed and Breakfast. One way ferry crossing to France. Lunches and snack stops with water refills en route. Evening Meal reservation - meal price not included in package. Transfers to airport at end of event. Any spare parts used in maintenance. By nature all activities contain an element of risk.Your leaders will be first aid qualified and will carry the appropriate safety kit for the activity, such as first aid kit and from time to time mobile radios. Safety equipment carried will be appropriate to trip. The leader's primary role is to ensure your safety, but it is your responsibility to listen to their guidance and instructions. Please read, and listen carefully to all safety instructions. If the weather and the cobbles are wet - it may be advisable to avoid them in order to stay safe - and to avoid slips and tumbles. If we prepare for all conditions then we may be pleasantly surprised! It may be hot (dependent upon the time of year) so plenty of water and suncream may be advisable. Equally rainy conditions are a possibility so do bring a lightweight waterproof. This ride is often a September ride - so prepare for warm, but potentially slightly damp riding conditions. Adventure Cafe can provide picnic lunches, expertly set up with tasty local food. We can also organise and include dinners in both Calais and Bruges - to simplify proceedings.